This is wonderfully glyphed and rather intense smoky quartz with citrine core with healed base from Brazil, weighing 13.9 oz and measuring 4.5” by 3” by 2”. She is an empath, a warrioress … she has her back sheared off and damage to one side … the side has healed and the back is healing. The damage shows her geological formation however as she started as a citrine core with an elestial smoky quartz secondary growth. 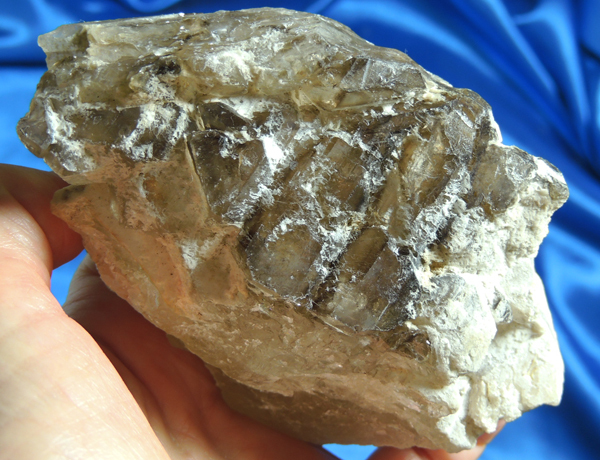 The original quartz is etched and there are areas of the core exposed. She is most definitely an Old Soul with great healing and adaptation skills. She is a wonderful, heady, energetic Spirit of Atlantis with a positively ancient look and feel who would love to have a Keeper who will give her a chance!